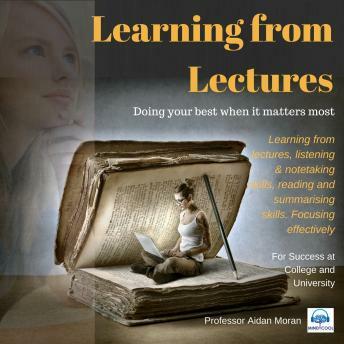 Aimed at students in college and university, this new audio single "Learning from Lectures" is taken from the bestselling album: "Learn to Study" by Professor Aidan Moran which teaches students the most important study skills for success at college and university. This audio will cover the areas of: Learning from Lectures, listening and note-taking skills, reading and summarizing skills, and focusing effectively - concentration skills. Since the Middle Ages, the lecture has been the most popular teaching method in universities. It's efficient, flexible and can be inspirational in the right hands. But taking good lecture notes is a very difficult skill for at least two reasons. First, because lecturers tend to speak faster than listeners can write, taking useful lecture notes can be difficult for some students. The problem here is that note-taking requires you to switch attention rapidly between listening and writing. And since you probably never received any training in this multi-tasking skill at school, it's not surprising that you may find yourself struggling to keep up with what the lecturer in saying in class. This problem is made worse by the fact that many students mistakenly believe that they have to write down every single word uttered by the lecturer during class - a false assumption that we call the sponge approach to learning. Research shows that top note-takers are highly selective in what they write - they sift what the lecturer says for the main ideas rather than trying to wrote down everything. The second difficulty that many students experience during lectures is a loss of concentration. This mental switch off happens mainly because it's difficult to stay alert during a lecture if you're sitting passively for a long period of time. When combined, these two problems make it difficult for students to get the most out of the lectures that they attend. And so, in this audio, I'll suggest some practical strategies that will help you to turn lecture attendance into an active learning experience rather than an empty ritual.